In the paypal message field, please put your email address and what level of kit you are ordering (Full, minus wood ends, minus pitch/mod wheel assemblies, or minus wood ands and minus pitch/mod wheel). I will write back a confirmation email. -Machined aluminum custom P2021 pitch bend and modulation wheel assemblies. Furthest From Me (Florida): 60USD Shipping. I can and will of course calculate shipping for your specific country as well. 11/26/18 – Board “B” complete re-route for signal on top, power on bottom with ground isolation + plug in modular VCO boards designed and ordered. 12/14/18 – Prototype fully calibrated and functional with new “B” PCB and VCO boards. Sound samples provided on SoundCloud. 12/15/18 – Pitch and mod functionality tested. Adjusting R117 and R118 on “B” PCB from 8.2k to 15k and adding optional inline 1M pot for adjustable pitch range. Without trimmer = ~1 octave range. With pot = ~1 half step-1 octave. 12/16/18 – 5 pieces each of prototype sheet metal enclosure top and bottom ordered. 12/16/18 – SLS 3D printed enclosure support bracket and Pitch/Mod wheels ordered. 01/08/19 - Alpha prototype unit rough assembly complete. 01/09/19 - Start design of production pitch/bend assembly. 01/14/19 - Production pitch/bend assy design complete. 01/17/19 - Waiting on prototye pitch/mod assy manufacturing. Compiling kit pricing. 02/03/19 - Open for deposits, first round of kits! As I have probably mentioned in a couple other threads, I had intended to build a Pro-One clone of sorts - not a rack or module, but a whole standalone monosynth. Well, I've actually been working very hard on this for the past few months, and thought I'd start a thread to document my progress. My end goal is to possibly offer these in DIY kit form if people are interested, though it seems many more people are interested in modular than keyboards here. I, myself play in bands that play out and modular is not so ideal for that, hence my interest in standalong keyboards! Plus, I just think they look f**king cool! Before anyone asks, yes I know that Beringer already re-popped the Pro-One and it's probably like $200, but it's again a rack, and also I really don't like Beringer stuff (personal opinion only!). Oh, and I like to build my own stuff right here in the good ol USA. The whole process allows me to build my engineering skills (I am a ME by trade and graaaaadually learning EE stuff by working with synths) and have some fun along the way! 4) Better pots all around and actually use some Audio taper pots where applicable (the original uses linear pots for EVERY pot)! 6) Simple enclosure with max of 2 custom sheet metal parts. When I started with the PCBs, I decided it would be easier for me (and due to limitations of my PCB house having <=500mm length of PCB) to make the PCB in 2 pieces: 1 for most of the CPU and modulation and LFO stuff from sheet 1 of the schematic, and 2 for the rest. The 2 will link signals via 2 ground shielded ribbon cables as a "bus" much like how the original Arp Odyssey did. 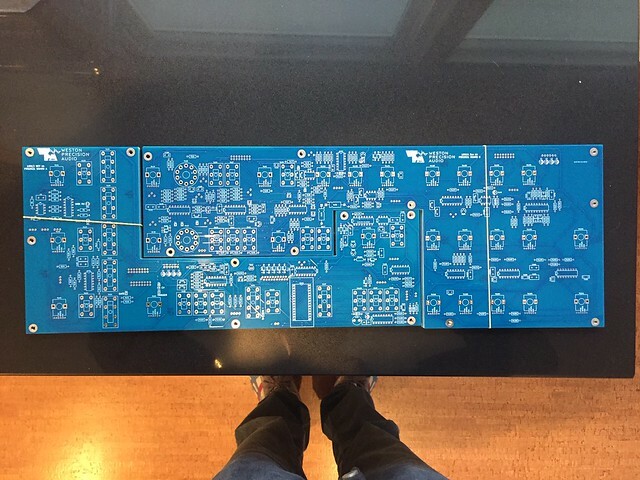 -All electrical components have been purchased for the first prototype. -Mechanical design is probably ~70% done (Render shown below). 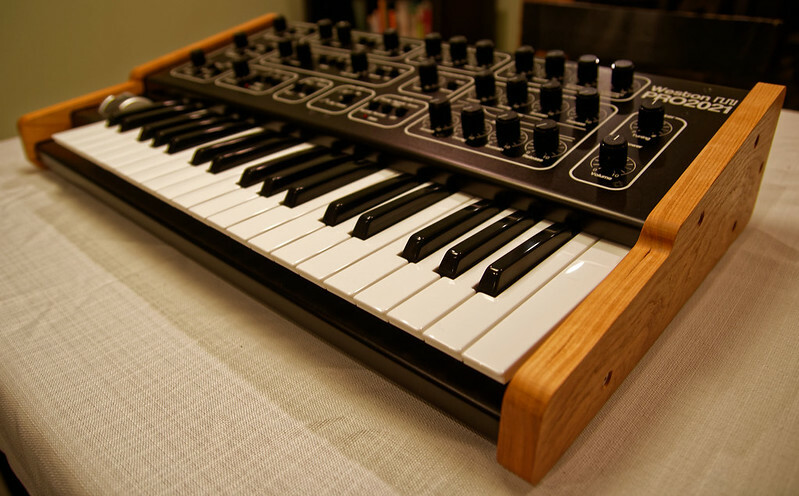 The keyboard is built with 2 anodized and laser etch sheet metal panels, attached with some PEMs, and tied together by the 2 Teak Wood CNC machined end cheeks and by 2 internal 3D printed support brackets. I will report back with status updates. Tomorrow I will begin stuffing the main PCBs! Great project. 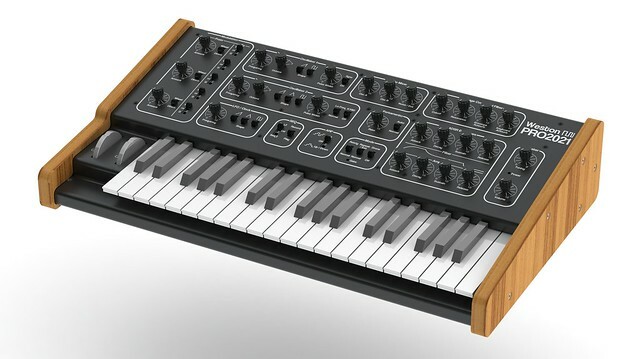 A stand alone mono synth was the gateway drug for me. Mono is good. Obviously too late but did you think of 2 types of sync? a 3 way slider for sync would cover that. Slip this down to the mode section and you have room to add a slider for a triangle wave on Osc 1. (edit) LED for the LFO and up its top speed. Something builders could do themselves if this turns into a project. this is really cool.. will it also have cv/gate in/out? or just midi? Would it work with other keybeds? As an owner of the original Pro-1, that was my only regret on the SCI design: soft sync only. I'm a big hard sync fan and really wished it had it. I'm interested in building something like this - curious what the all-in would come out to. Thanks! Unfortunately I did not realize people wanted the hard sync on this! Like I said the proto boards are hitting my house today, but I think that will be easy to add later on a revision! Yes! It will have all the jacks of the original including the Audio In, as will as MIDI in out and thru. Sweet! Once I get the drawings done for the sheet metal, I've got some work to find an affordable source, but I have a lot of connections in that industry, so I'm feeling pretty confident. For this proto build, some of the more expensive pieces are the one-off purchases of theTurbo CPU ($120) and the Fatar keybed ($100). So I've built this to give the original CPU (or the TUrbo CPU in this case) the 3 octave switch/diode matrix that it expects. It so happens that the Fatar 37 key OEM unit has this configuration. As long as the other keybed was laid out with the Make/Break switches the same, it would work. The other way would be to just operate strictly off MIDI, but you would lose the built in Sequencer ability (that's why I chose to use the fatar direct to the CPU). The sequencer is pretty neato. Following this with great interest! That's great, then it should be possible to use any other switch/diode matrix keybed. I'm not sure how accessible a 37 key Fatar keybed is, but it should be quite easy to re-use a broken midi controller. Indeed it is not so easy to procure the 37 key OEM Fatar, but it is certainly possible. I have a feeling if people wanted to do a group buy and someone just got on the phone with Fatar and asked for a quote for 10 for example, they would sell them. I did a quick check and looks like everything is OK, except I screwed the footprint of the 6 3PDT switches up and the pins are off set from the center by 30 mils. DOH! At least the nominal position is right. I can make it work still though and have fixed my Kicad file so the next batch if there should be one will be correct . Amazing. Love these super ambitious projects! I am definitely interested, this sounds awesome. Very ambitious (and exciting !) project ! 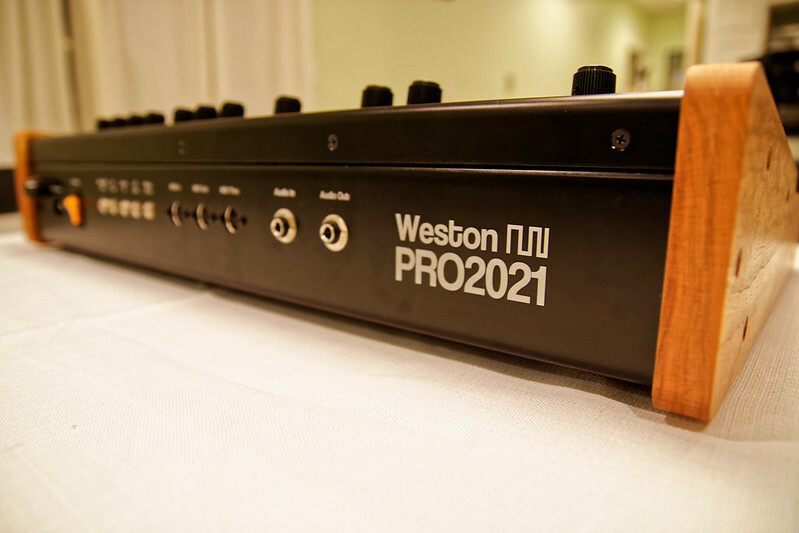 I am looking forward to see how it evolves, I love the Pro-One to bits. - Will it feature the very same sequencer (2 patterns, 40 notes each) ? I like this sequencer a lot for quick and dirty sketches, basslines, complex arpeggios, etc. Could we imagine to be able to export/re-import the sequences somewhere, in some way (using Midi, maybe) ? - Will the LFO and sequencer sync to audio in trigger (this feature is a-ma-zing tok play everything in sync with other gear) ? - Will the filter feature the same "uncompensated high resonance volume loss" ? It could be a feature, for the sake of a 1:1 clone, but it is also something i don't like a lot with that filter... So a switch allowing for "classic" and "compensated" would be great (a bit like Korg did for the Odissey reissue). 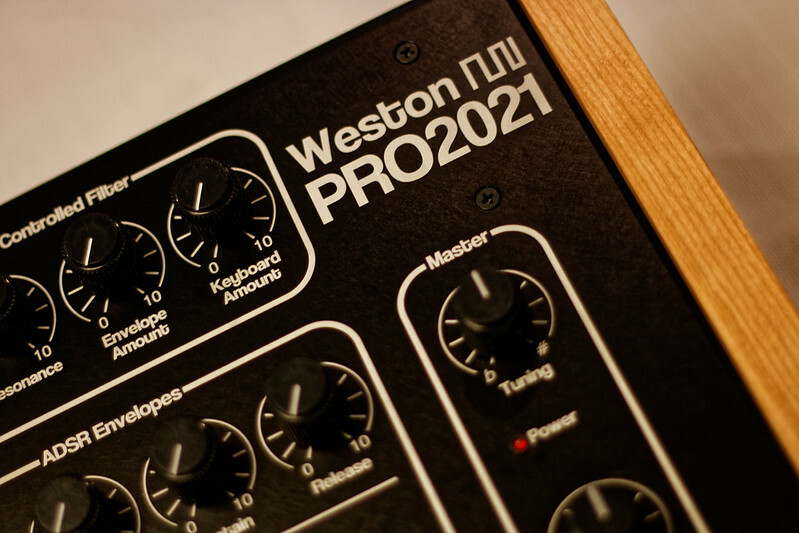 1) For this, I am using the Music Technologies Group "Turbo CPU", so yes it behaves exactly the same as the original 8021 CPU used on the Pro-One, including the sequencer. 2) Yes. 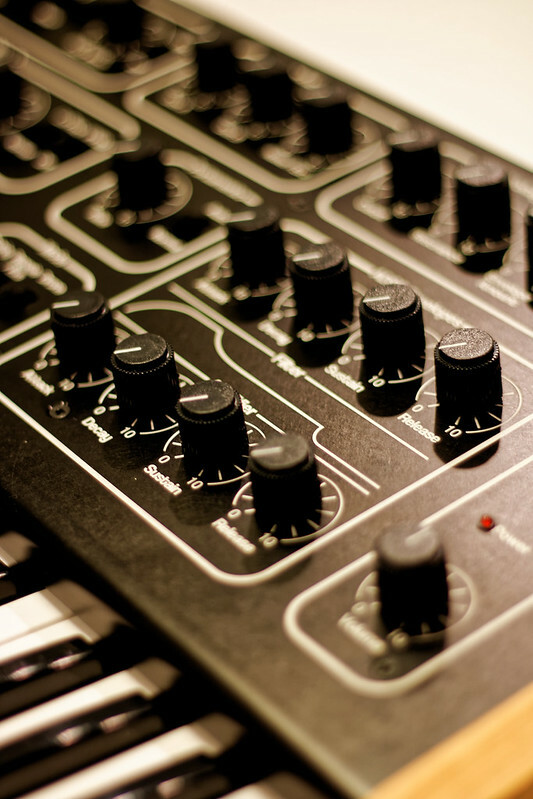 The Pro-One rectifies the audio in signal to a threshold adjusted in the Mixer section and syncs the sequence. 3) I'm using the AS3320 clone of the CE3320, so I assume they behave quite the same! I haven't used this chip yet before though. This will be a first. 4) Absolutely will consider this. The hard thing will be to figure out the sequencer. Option 1 is to keep the CPU and just waste the keyboard wiring and the DAC involved in this circuit (since you'de obviously be just be using MIDI and/or CV in this config). Option 2 would be to make a new , simpler CPU module to retain only the sequencer portion. THis is beyond my skillset right now, but perhaps other DIYers will want to tackle this! There's a part of me that says "stack two of these together like a prophet 10"... I don't know why, but it sort of sounds like a good idea. The resonance of the AS version has a different behavior. Good to know! I'm sure it will still sound pretty good though!